Hi everyone! Sorry it’s been a few weeks but you know how crazy it can be around the holidays. So, let’s jump in to my review of Flying Too High to kick off this review week! Flying Too High is the second book in the Phryne Fisher murder mystery series. Feel free to check out my review for the first story, Cocaine Blues. Phryne is settling in to her new life in Melbourne. She has a new house, a new car, and has established Dot as her official companion. She’s ready to make her name as a lady detective and is ecstatic when she’s brought on to prevent a potential family murder. What follows is a gruesome death, daredevil flying, life threatening stunts, and the resolution of two mysteries. As mentioned before, I was first introduced to Phryne and her adventures on the Miss Fisher’s Murder Mysteries tv show, which can be found on Netflix. As such, I had fully expected most of the stories to follow the same plot lines as the tv episodes (something I was totally fine with), but I was pleasantly surprised when Flying Too High offered something new! 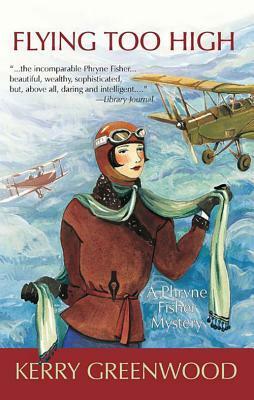 I won’t provide any details about the mysteries to prevent spoilers, but i can promise Flying Too High provides the same quirky cast of characters, and fast paced antics that can be expected of a Phryne Fisher story. I also enjoyed the aviation sequences, which were written quite accurately according to my limited knowledge of post-WWI aircraft designs. Aviation is a hobby of mine, so I appreciate when it is presented realistically. But I have two warn up, there are a few action sequences that are over the top. For those serious readers who would be insulted by such antics…these books are not for you. For everyone else…you’re gonna love it! Flying Too High was a fun read and I’m ready to pick up the next installment of the series. It’s perfect for any time you need a quick escape from reality and I highly recommend it if you have a case of the holiday blues. Let me know what you think! Anyone else love all things Phryne Fisher? !